Last year she provided her voice for The Smurfs movie, and it seems Katy Perry just can't let that character go. The 27-year-old singer arrived at the Viktor and Rolf Autumn/Winter show in Paris today wearing an ensemble that Smurfette would be proud of. As she posed for photos outside the Espace Ephemere Tuileries, it was clear to see that all eyes were on Katy. The U.S. star, who is known for her eccentric style - particularly onstage - clearly couldn't find an outfit to contrast with her bright blue hair so she simply stuck with her favourite colour. However, her stylish look didn't exactly go to plan as the unusual coat that she wore was a completely different shade of blue. The unique ensemble featured large lapels that were complete with a cut-out design and fishnet and was obviously made to match the dress that she was wearing underneath. The black number was decorated with the same pattern, and Katy completed it with a pair of black tights and bright blue heels. 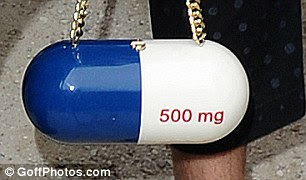 On her arm she carried a small Christian Louboutin pill-style bag that was complete with a chain strap, and she teamed it with a pair of dark sunglasses. However, not one to be camera shy, the Teenage Dream singer later removed her shades and flashed a huge smile for the photographers as a hoard of fans looked on. Her make-up was perfectly in place as she sported heavily made-up eyes and a hint of pink lipstick. She was later spotted enjoying the catwalk show next to U.S. model and DJ Leigh Lezark. Katy was no doubt in awe of Viktor and Rolf's latest collection which featured floor-length dresses which was designed with a mixture of black velvet, ruffles and tassel fringing. The models, who all wore their hair in slicked back ponytails, also showed off over-sized fur coats and patent boots. Despite the brightly-coloured attire that Katy chose to wear to the show, her outfit was actually rather conservative compared to what she's been wearing in the French capital over the past few days. On Thursday she was seen heading out for dinner with friends at Invalides Place and decided to show off her cleavage and her bare legs. The very short and very tight gold patterned dress highlighted her curves perfectly and showed her ex-husband Russell Brand just what he's missing out on.